4 bedroom, 2.5 baths, 3 car garage with a fully fenced in backyard on the water and 3,200 square feet of living space! Welcome Home! Beautifully maintained the Pride of ownership shows throughout! Sound system runs through out the home. NEW WATER HEATER,DISHWASHER, BACK SPLASH,LIGHTING FIXTURES THROUGHOUT, NEW CAN LIGHTS PUT IN KITCHEN, NEW FULLY FENCED REAR YARD. 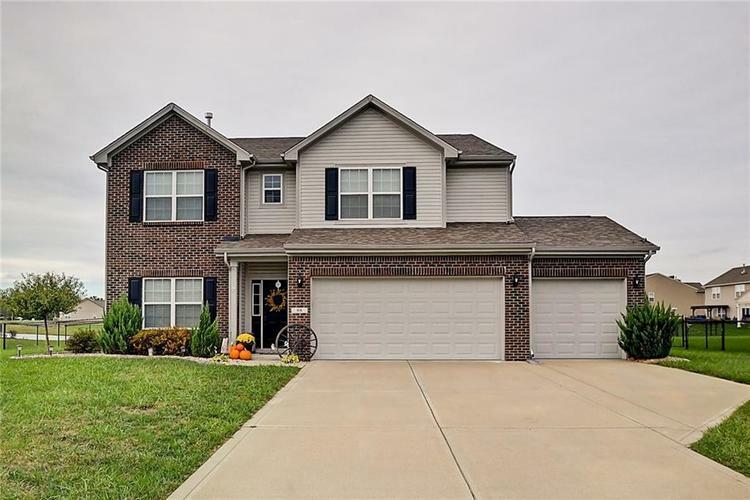 OFFICE IS CURRENTLY USED AS A PLAY AREA, WOULD MAKE A GREAT 5 TH BEDROOM ON THE MAIN LEVEL.BOARD AND BATTEN RECENTLY PUT UP IN FOYER.open concept floor plan has the kitchen flow into the great room. All bedrooms upstairs have walk in closets. Master bedroom has a sitting area and cathedral ceilings. No Curtains or RODS stay just blind! Directions:US 31 South to Whiteland Rd. West on Whiteland Rd to Sawmill Rd. South on Sawmill to Entrance of Millstone (Mica Drive). At "T", Turn Right onto Blue Lace Drive which turns into Vermilian. Follow to home on L.